Ten years ago, before smart phones, tablets and social media changed the world, senior housing and home care companies found 80% of their leads and move-ins coming from B2B professional referral sources – physicians, hospital case managers and discharge planners, physical therapists, financial managers, realtors, 55+ communities and senior centers. The other 20% came from B2C marketing and communications – street signage, advertising in the newspaper, directories and the Yellow Pages, special events, newsletters – plus word-of-mouth from friends and families of residents, and walk-ins. The growth of the Internet and digital technology has dramatically changed the industry’s marketing mix, especially how companies get new leads. In much the same way we began using Priceline, HotWire, and Kayak to search travel deals and how we learned to research features and pricing online for the new cars we want to buy, we are now vetting our loved ones’ senior care possibilities via the Internet. Some leads still come from professional referral sources; but many, if not most, are now coming from the Internet. How Do Internet Leads Differ from Traditional Referral Sources? 1. The lead, generally a Boomer woman who, as an adult child decision-maker, has done extensive research online and narrowed down a field of possibilities that may or may not include you. Considering future options for an aging loved one. Experiencing behavior changes in a loved one who needs more care. Dealing with a serious health diagnosis. Needing care within a few weeks, days or hours because of an event involving a loved one — perhaps a fall, a fractured hip, a stroke or memory loss that causes wandering away from home. 3. She has researched her options without speaking to a doctor or hospital case manager, let alone anyone at your company. 4. She is hard to reach via phone and prefers communicating by email or text. 5. Because she is researching more than one Independent Living, Assisted Living, or Memory Care community or Home Care company, and she is likely interacting with online directories and referral sources, your sales cycle may seem longer now. And then again, maybe it’s not. 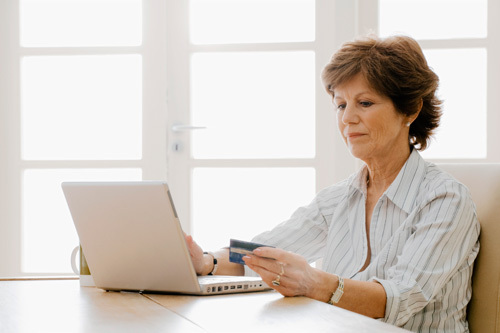 According to a 2013 study by Ipsos and Google about reaching Boomers and seniors online, 83% of Boomers and seniors go to the Internet to learn about a topic of interest and 57% are now shopping online. Boomers and seniors were late adopters of mobile technology however today 60% have used a tablet to seek information and 58% have sought information via a smartphone. Boomers are also making purchases via mobile apps — 40% have bought something with a smartphone and 49% made a purchase via tablet. News flash: Your consumer is using the Internet to learn about and eventually purchase the things she needs. Senior care is one of the things she may need. Digital is now a primary ingredient in a successful marketing mix. Digital referrals do behave differently than referrals from the hospital or rehab because they are generally not faced with an immediate need to move. Not every senior housing community can rely solely on hospital case managers and discharge planners to fill their census. Internet leads are viable but you simply can’t handle them the same way you handle walk-ins and professional referrals. A quick response to the lead, aka “speed to lead” via phone, text or email is extremely critical. It may take three or four contacts to reach them, so sticking with communication outreach is also important. And finally, your sales team will take good advantage of their Internet leads, moving them through the system to move-ins, if and when they are fairly measured and compensated for their efforts.